Dr. Jason Fung: This week I’d like to share Dolly’s story. She has been able to take control of her health, losing over 100 pounds in the process. Interestingly, she hasn’t had problems with loose skin, which is our experience, too. In 5 years of the IDM program, I have not referred a single patient for skin removal surgery despite in some cases, like Dolly over 100 pounds of weight loss. There is very little data about why we see this phenomenon, although I suspect the body was burned the excess protein for energy. Here’s her story. Dolly: Let me start with the most heartfelt of thank you to Dr. Fung, Megan, Nadia and all the staff and members of the IDM program and Nadia’s LCHF/Keto Facebook Group. You have given me back my life, literally, and I will be forever grateful. The process is one of serious intent and diligent effort accompanied by joyful scientific curiosity and kind support. In a little over a year I’ve gotten rid of 105+ pounds which is more than two of my friends even weigh! Isn’t it amazing that we belong to a program that doesn’t need to put the disclaimer, “Results not typical” on such success stories because these life-changing results ARE typical! 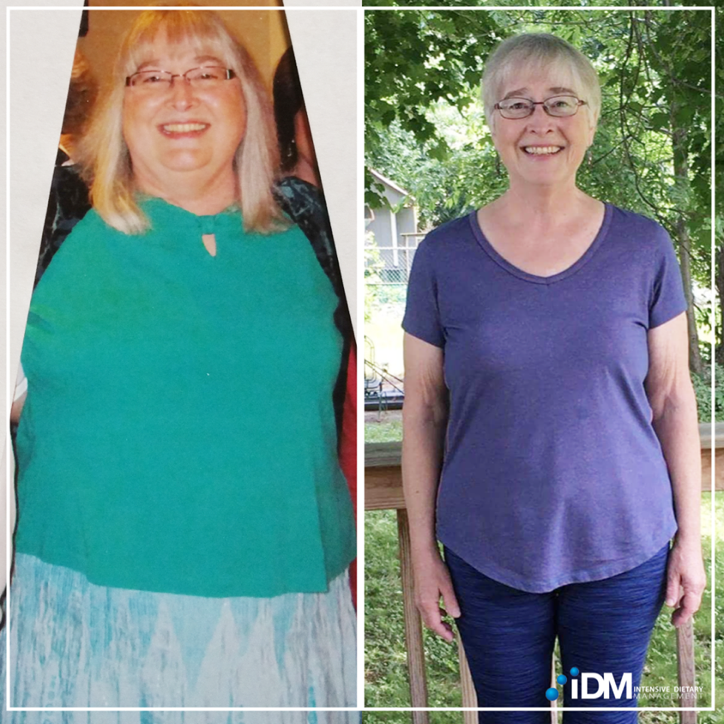 When I started the IDM Program back in 2017, I was 61 years old and, at 5′ 4″ tall weighing 260.9 pounds, morbidly obese. I had many symptoms of diabetes and poor heart health: sky high fasting insulin, elevated blood glucose, eye issues, shortness of breath, swollen ankles/legs/feet, multiple and multiplying skin tags, numbness, mental fog (which was especially terrifying to me because my mother and all her sisters died from Alzheimer’s), pain, extreme tiredness, heart palpitations, osteoarthritis, back pain, sleep apnea, etc. I had also developed a severe case of Plantar Fasciitis which kept me from walking. I discovered Dr. Fung’s YouTube lectures and the IDM Program. I was so downtrodden at that point, so scared and I’d tried pretty much everything else. Retired and on a fixed income, I figured I could pay for the program with the money I saved by fasting and that has proven to be true. I was also taken by the sincerity and care so evident in Dr. Fung’s words and demeanor. Here was a doctor that understood that people weren’t lying when they said they had really tried counting calories, and eating low fat, and having six meals a day as advised, and exercising, etc. etc. etc. but that those things just didn’t work long term. He didn’t think I was lazy, or gluttonous, or lacking self-control. He got that no matter how much I ate, I was still always hungry…even paradoxically when I was physically full at the same time. And he knew what caused that hunger and it wasn’t some character flaw in me; it was too much insulin! One of my big concerns was having lots of excess skin if I was actually successful in getting rid of the 100+ pounds I needed to lose. We’ve all seen those horrible pictures of people holding great handfuls of loose skin at their bellies. At over 60 years old I have less elastic skin. But I am happy to report that, despite having lost all that weight in just a year, I have very little excess skin at all and that is without lifting weights or doing other strenuous spot-reducing type exercises. I have no way to prove it, but I think it must be due to the consistency of basically fasting 3 days a week (autophagy? ), in some fashion, most weeks during that year, combined with eating the most well-balanced, nutrient dense, lazy keto meals (2 per day on feasting days) I could devise. I really feasted when it was a feast day, eating only foods whose taste I truly enjoyed and always eating to satiety. My formerly huge “sweet tooth” is happy with just a couple of squares of 95% dark chocolate dipped in a little coconut cream with a handful of raspberries for a special treat. If you only knew how amazing that is! I am so fortunate to have family and friends who have been very supportive the whole time. At social gatherings many people they figured either I’d cave in and go back to the SAD (Standard American Diet) and then be miserable, or else I’d “be strong” and not cave in but would look so pitiful, salivating over what I couldn’t eat that they would feel guilty and we’d all be miserable! Instead, they learned (and I learned) that if all that is available is SAD fare, I can unobtrusively have a nice glass of water with lime and fast and just enjoy the company. Easy! I blend because I’m content, not starving, now that I’m a fat burner. I don’t think I could have done it without that coaching initially. I always learned so much from both Nadia and the other IDM members on the call. If you’re feeling like you want to bury your head in the sand because you’ve “messed up”, DON’T! Post something on the forum or Facebook site. You will be amazed how quickly, and how much, non-judgmental support you will be offered by others who have been there or who are there right now. I’ve made some great friends that way. We nerded out on keto/fasting while walking on the beach which I could do because my Plantar Fasciitis is gone! After just six months on the IDM Program, I had lost 75 pounds and my fasting insulin had dropped to 4.3 micro IU/M and my fasting blood glucose was 75 mg/dl! Not just “normal” but really great! I was amazed. My doctor was though, has not been supportive. When I first told her what I was doing (after I’d been in the program 3 months and had already lost a LOT of weight) she actually got angry and told me I was being duped and that fasting and “all that fat” were dangerous, and tried to get me to read a book on veganism and follow that instead. I tried to give her information but she was not receptive. When I had my yearly physical in November 2018 and she saw those amazing numbers she was still convinced that the way I’d lost it was not a good one. But last month, down 105 pounds, very happy and healthy, she asked me if I was still following the same diet. I said yes and that when I recommended Dr. Fung’s latest book, “The Diabetes Code” for helping other patients she wrote it down! I’m actually looking forward to my annual physical this coming November. I lent “The Diabetes Code”, to a friend whose husband has been diabetic and on insulin for years. He’s now off insulin! My sister, marathon runner/triathlete who still always struggles with her weight (so much for calories in/calories out – she’s even done ultra-marathons!) has started fasting as well and loves it. Even though I’ve gone from a stretched-out size 3X, to a real size 12, I still have a ways to go. My new goal is to get my waist/height ratio to .5 or below. I took six weeks off of fasting while I moved to a new town and had two cataract surgeries. During that time, I continued to eat two hearty Low Carb, High Fat meals a day on a 16/8 schedule, no snacking, and am happy to report that my weight remained under 155. (It’s so wonderful to be able to begin my weight with a one!) I was a little afraid that the minute I stopped fasting three days a week my weight would shoot up; so happy that is not the case. This really is a lifestyle that works and is maintainable. I no longer feel a sense of urgency and self-loathing around diet. Instead I feel a desire, out of self love, to do what makes my body sing and to help others do the same. Dolly, that is a great story! Congratulations. I always wonder about doctors and how they get/got into this mindset that the patient is always wrong. If I was a doctor and a patient walked into my office that lost 100 pounds in one year, I’d say “I’ll have what she’s having”. I wouldn’t say “You’re killing yourself!”, as that does not make sense. Ha Ha Ha Thanks Bob! When I read that she is fasting 3 days a week, I implicitly understood they were alternate days, not consecutive. I agree with you that 3 consecutive days of fasting each week is a lot. Maybe Dolly or someone working with Dr. Fung can clear up this. In addition, she follows a strict low-carb diet, two meals a day, within an 8 hour window, on the other days. I, too, would like to know whether Dolly fasted 3days consecutively each week, or whether she did alternate day fasting. Thanks Bob 🙂 I’m glad it’s helpful to you, as the stories of so many others here continue to be for me. Personally I consider ANY fast a victory! It’s so funny how our perspectives change over time. Before I started the IDM program, if someone had told me my “feasting” days would consist of just two meals eaten within an 8 hour window (and that I wouldn’t be hangry all the time doing it) I would have told them they were crazy. Now that’s my new “normal”, no problem. All the best to you. Dolly- are they 3 consecutive days of fasting per week or alternate days? Bob, that regime sounds impressive to me. Do you need to do more or are you just curious and like a challenge? The feeling is mutual Judi! Ha Ha Ha Love that! Dolly! Congratulations! You are inspirational. Thank you! Just the fact that I don’t have those uncontrollable cravings, and the cravings I do get I am finally able to control and am strong enough to fight them. I used to feel guilty for letting them control my life, but now I know it’s not my fault. Can you imagine if every patient with metabolic syndrome knew they could finally live without those cravings taking over their lives, how their entire future could be changed? It’s so exciting! Well done, Dolly. On what possible evidence would the doctor be advocating veganism? Even its honest adherents admit it’s a moral position and not one that provides the best health. Does anyone have stomach or bowel problems with low-carb and 16×8 time restricted eating? On the plus side, I’m rarely hungry and control my weight easily. When I first adopted time restricted eating I was constipated but that seemed to resolve itself. Eating this way has had many benefits but my system seems to be rebelling and I’m trying to work out why. Not enough fibre, perhaps? I’m really struggling to see what I’m doing wrong. Any thoughts would be appreciated. Hi Dolly Congratulations you look fantastic and adorable. Question: I do alternate day fasting which works out to 3 days of fasting a week. Is that what you did or did you fast for 3 days in a row each week? Arlene, how long were your longest fasts? And how long were your typical fasts? Congratulations Dolly. I have been feeling guilty for ‘falling off the fasting wagon’ My mindset is still one that thinks I deserve to have some sugary sweets etc. even though I know I can fast easily and I know how good I feel when I do. Thanks for your post. It has given me the inspiration I need today to forgive myself and just fast. That is so awesome Dolly! Truly inspiring. I am a beginner doing 16/8 fast on my 2nd week now. The reason I am encouraged to do IF because I easily get tired due to overweight and legs hurt most of the time due to high level uric acid. May I know if while doing Low Carb IF does your uric acid level shoot up because of high protein content food? Great story and a great contributor to the Fung Facebook community! The doctor suggested veganism?? Veganism is a cult, and if the doctor did this out of ignorance, it is one thing, but if it was a serious recommendation you need to change doctors. I suggest that you start watching the testimonials from reformed vegans; it is not pretty. If veganism gets mixed up with the ketogenic diet, it will be the end of the ketogenic diet. 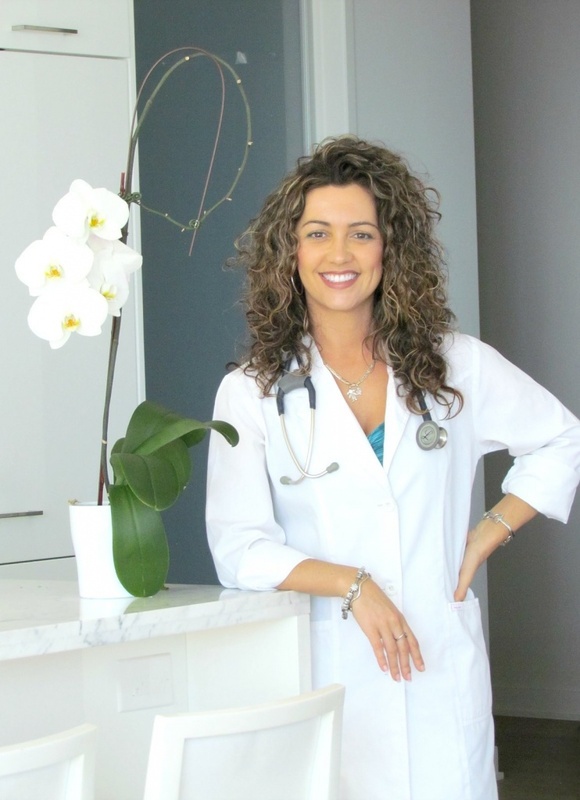 You won’t know what to attribute the chronic diseases to – veganism or the ketogenic diet. Dolly your story was written in a way that was inspiring and it made me giggle at times too. Thank you for sharing. This is so inspiring.I tried to talk to my endo crinologiist who was very happy to tell me I will never get off insulin.Well she is wrong.That is my goal and I am determined to do it. And so you shall Brian! I only wish your results were typical. Not so for me. Still struggling a year later with not much to show for it. I will try again but it is not easy. You are such an inspiration! I’m 62 and you look beautiful!